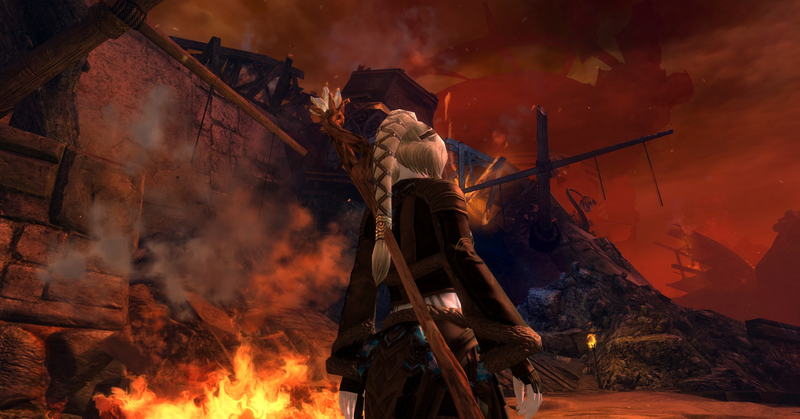 Caetwyn prepares to rescue the people of Lion’s Arch and slaughter her enemies! 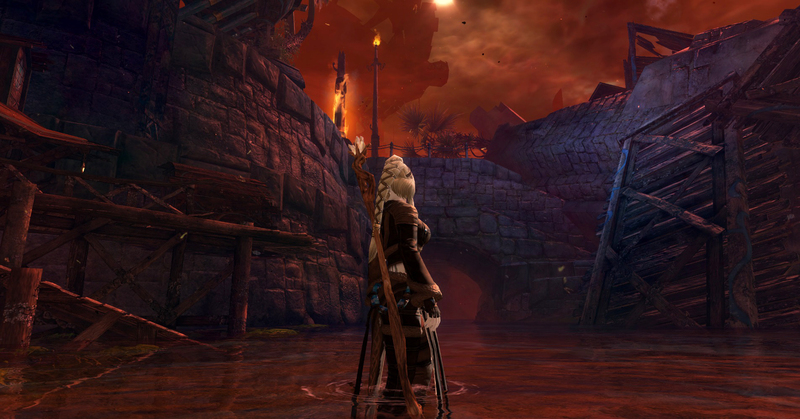 The latest chapter in the ongoing ‘living story’ of Guild Wars 2 has the central city (Lion’s Arch) under siege by a typically diabolical foe and their equally diabolical minions. I regret that I’ve been too preoccupied of late to participate in the recent story arc, so I’m not as familiar with the background behind the razing of the city as I’d like to be, but I damn-well made some time to see it happen and do what I can to save Lion’s Arch! I was afraid that this event would be a repeat of the Karka catastrophe, that was mostly available only to people who were fortunate enough to live in the right time zone. It was a one-time affair that people could only repeat if they could score an invite into a group on an overflow server. The constant creations of overflows helped drag the event out for several hours, enabling people who wouldn’t have made it a chance to play. I, myself, barely made it onto an overflow and was having such a great time bringing down the beast, but just before its demise the game was patched and the event was over. 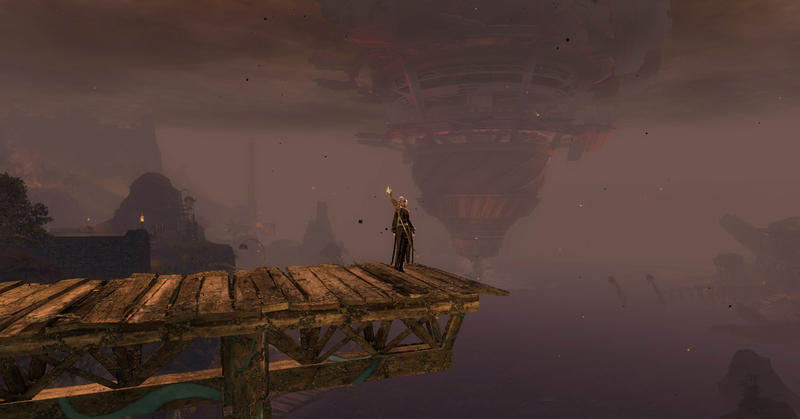 Suffice to say the Karka catastrophe left a bitter after-taste, so I approached the razing of Lion’s Arch with a mix of trepidation and enthusiasm and heartbreak. 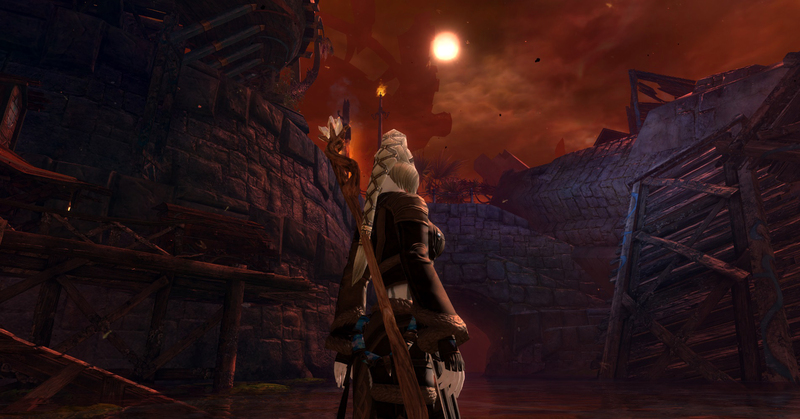 But the masterful masterminds behind Guild Wars 2 have done a spectacular job. Taking onboard all the feedback after such a disastrous event, they’ve created something that both contributes to the story in a one-time-only fashion, but are dragging it out through the course of… Actually, I don’t know how long this will last, but it’s already been several days longer than the brief window for the Karka catastrophe. Now the city is too hazardous to enter at times, and certainly too hazardous to linger too long. The complement of story content in gameplay windows like this is fantastic for enabling everyone to access and experience the event without having to resort to trickery. 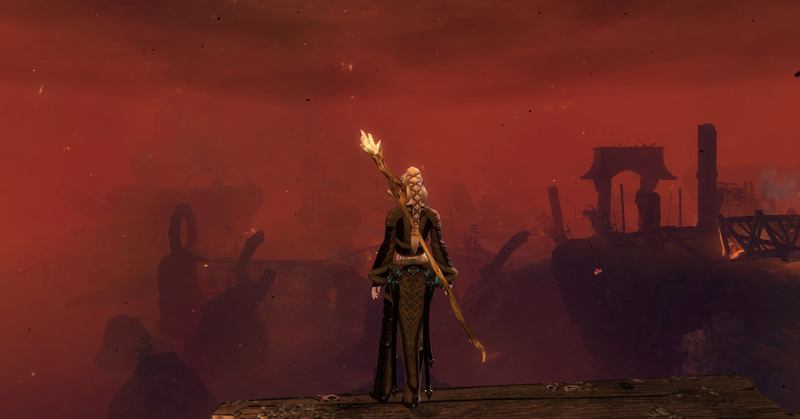 Bravo, ArenaNet. Bravo! It was hard to watch, especially as a cut-scene doesn’t let you react. 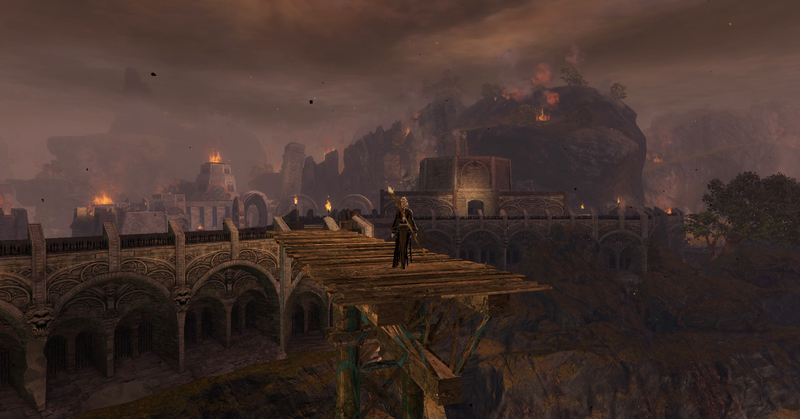 Being a passive observer through a minute (or less) of watching an invasion of the city was rough, but to then land in the thick of it and see the extent of the destruction… It was about as eye-watering as that first swim to find the ruins of the Old City under the bay. 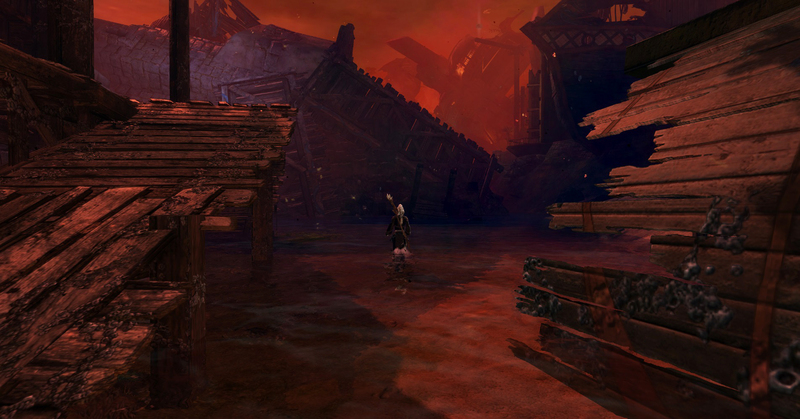 Lion’s Arch is a character unto itself, having been at the heart of the story since it began (at least as far as game play goes). It’s the central hub where all the races converge and trade (sometimes goods, sometimes insults). It’s brimming with pirates, which gives it a salty edge, and every cave seems to harbour some ‘secret collective’. And yeah, there’s a jerk in a well. It hosts Winters Day and Halloween, and DragonBash, drawing everyone from everywhere to participate. 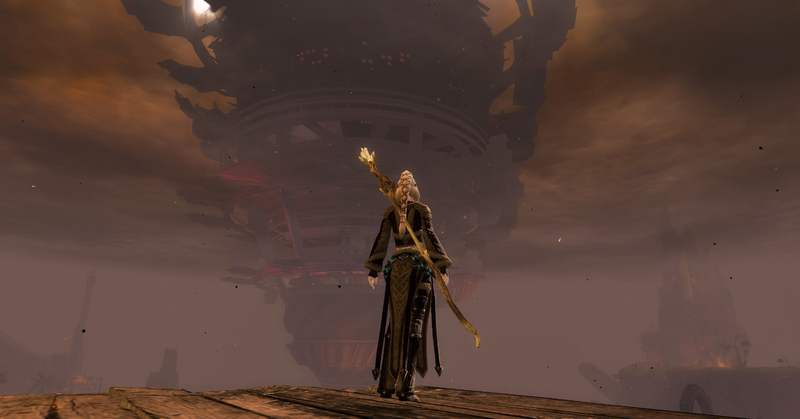 Lion’s Arch is the backbone of Tyria, and it’s just been broken. Though Caetwyn is still a young character, not even half way to 80, she’s been digging through rubble and herding refugees out of harms way, all the while lamenting the damage done to her home away from the Shiverpeaks. The air is hot and poisonous, raining sparks and ash and full of great plumes of smoke. Buildings lie in ruins, centres of trade smouldering. The shore is overrun, and the horizon is consumed by a great and dastardly machine. It’s awesome and awful, and I am full of awe. 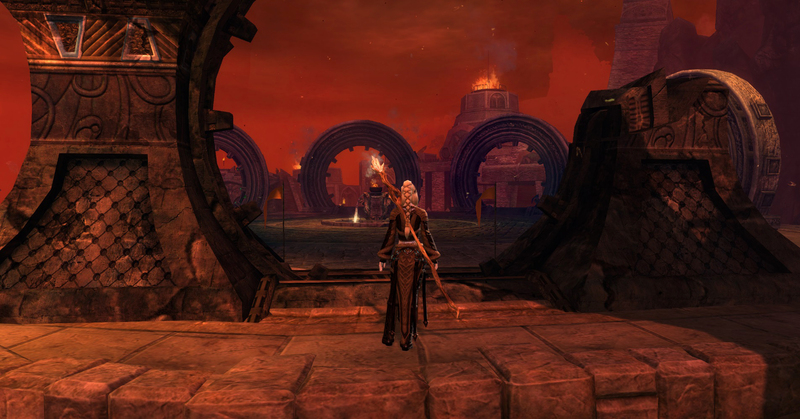 Caetwyn faces the blackened horizon from Lion’s Arch.